Shower bases, or pans, made of acrylic, fiberglass, or solid-surface material have made shower installation much easier, and today they are often used instead of custom ceramic tile bases, even if the shower walls are tiled. These pans are available in a range of stock sizes or can be custom-fabricated to fill a specific space. They are simply set into place before walls are finished and are connected to the drain system. Most shower pans are easy to install, and quality versions will offer many years of trouble-free service, provided they are installed correctly. However, it is common for some shower pans to flex underfoot, especially if a heavy user is in the shower. This may or may not be a problem, depending on the design of the shower pan and the degree of flexing, but in some cases, severe flexing can cause stress on the drain fittings and may cause a leak around the shower drain. In very serious cases, a cheap, brittle shower pan may even develop cracks in its floor surface. Normal "give." No prefabricated shower pan will be as rock-solid as a tiled shower base. Some small amount of flexing is expected and is not a problem if it causes no leaking. Cheap shower pan. All plumbing fixtures come in a range of quality standards, and shower pans are no different. A cheap prefabricated pan will have a thinner floor and fewer and less substantial support ribs beneath it, resulting in a base that's much more susceptible to flexing. Flexing can be minimized or eliminated if a cheap shower pan is installed in a mortar bed, but an insubstantial shower pan that rests directly on the subfloor is likely to flex underfoot. Heavy users. Children and smaller adults can likely use most prefabricated shower pans without incidence, but large, heavy adults are another matter. Consult the manufacturer's instructions for information on weight limits for the shower pan. Very heavy users may want to use other bathing options if they exceed safe weight recommendations for the shower base. Incorrect Installation. 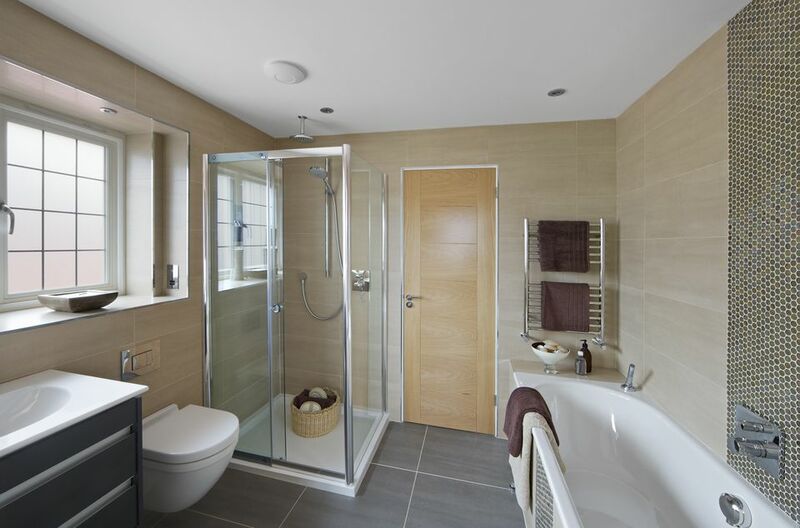 Prefabricated shower pans come in one of two types: those that are installed in a bed of mortar spread over the floor, and those that are designed to rest flat on the floor. If a mortar bed isn't installed with a shower pan that requires one, the shower pan will not be adequately supported underfoot and will likely flex whenever someone showers. Shower pans that don't require a mortar bed usually have support ribs beneath them that radiate out from the drain opening, which are designed to support the shower pan. But if the floor is uneven, those ribs might not rest firmly on the floor across their entire length, and this can lead to flexing. Also, if a shower pan has been shimmed on one side to level it, the ribs may be unevenly supported, with gaps in the center. And cheap shower pans may not have enough support fins to adequately reinforce the pan. For these reasons, some plumbers use a mortar bed even when the shower pan manufacturer doesn't specify one. Do nothing. If your shower base and drain fitting have been correctly installed, minor flexing will likely cause no problem at all. The flexing may be completely within the expected performance of the shower pan. If the flexing is minor and is causing no leaking, there may be no reason to worry. Add shims. A flexing shower pan resting directly on the floor without a mortar bed may need to be more adequately supported along the length of the support ribs below it. This can be a very difficult thing to do after the pan is already installed, but it may be possible to access the bottom of the shower pan from a room below the shower. However, this may involve cutting access holes in the ceiling. Install a Fernco fitting. A good plumber who anticipates flexing of the shower pan often will install a special flexible drain fitting in the drain pipe below the shower. The fitting is designed to accommodate the bending and flexing that occurs in prefab bases. Called a Fernco fitting, it serves as kind of rubber shock absorber that compresses and springs back when the shower base flexes around the drain opening. This fitting can also be installed retroactively from below the shower if your shower is flexing enough to cause leaking in the drain connections. This may require cutting an access opening in the ceiling below the shower, which can be patched after the fitting is installed. Remove and/or replace the shower pan. In severe cases—and especially if the flexing has caused the shower pan itself to crack—the only solution is to remove the base to make whatever fixes are necessary. This can involve better shimming for the support ribs beneath the pan or laying a mortar bed to support the pan over its entire surface. This is quite a major project, and if you are going to this length, you might want to take the opportunity to install a new, better quality shower pan that is more resistant to flexing. What Are the Rough In Dimensions For a Shower Door? Does Natural Stone Make Sense in a Shower? Did Your Glass Shower Door Shatter by Itself?